Most shoe owners claim that the upper is made of premium materials, giving it durability. Several buyers mention that the ankle strap enhances the aesthetic appeal of these performance high-top hoop shoe. Some purchasers love the glove-like fit of the Air Jordan 20. It provides a great ankle support and foot containment. According to a large number of users, the grooves of the herringbone pattern grip court floors well. Many testers say that the outrigger of the signature shoes of the Chicago Bulls star provides stability, preventing ankle injuries. A lot of shoe owners mention that the synthetic upper and inner sleeve provide good foot containment. At least a couple of buyers say that the upper leather is soft and comfortable. The strap of these basketball shoes from the Jordan brand is disliked by many wearers. Some remove the strap because they think it is pointless and simply gets in the way. The shoe runs big, say a couple of buyers. A handful of wearers observe that the grooves on the outsole get clogged up easily. The ankle collar does not stretch, making it difficult to put on the shoe. The Velcro used on the ankle straps are reportedly weak; they cannot hold down the strap properly. Overall, the Air Jordan 20 is preferred by wearers for casual use. The traction loses its grip after a few months of use, and it attracts a lot of dust. The ankle strap receives mixed reviews. There are online videos demonstrating how to remove the strap for those who do not want it. The cushion performs well for the first few months. However, it starts to become stiff afterwards. Even so, these Air Jordan shoes are a must-cop for sneakerheads who are die-hard fans of Michael Jordan. Overall, I'm super happy that I ended up grabbing these. Wan't too happy about the price because these things were wickedly expensive but they are so much more comfortable than the original pairs. It’s fun to look at older shoes and see how they molded and helped create some of the shoes today. The Air Jordan 20 was originally released in 2005, which marked the 20th year of the Air Jordan series. Designer Tinker Hatfield returned and teamed up with Michael Jordan himself to work on this shoe. This is Hatfield’s first Air Jordan after the 15. The shoe features the exclusive Independent Podular Suspension (IPS) technology in the midsole. It is said to provide impact protection and prevent stress on the knees. The outsole has a combination of traction patterns working together to provide an amazing stopping power. The strap doubles the foot containment the shoelaces already provide. The leather upper of the Air Jordan 20 features a dynamic change in design. The important events in the life of Michael Jordan and the Jordan brand are told through the lasered graphics on the strap of the midfoot and the numbers on the rear panel. As for those who are not fans of the ankle strap of this shoeb but love to rock high-tops, they can switch to either the first Michael Jordan hoop sneaker or the eleventh Jordan signature shoe. Cushion. 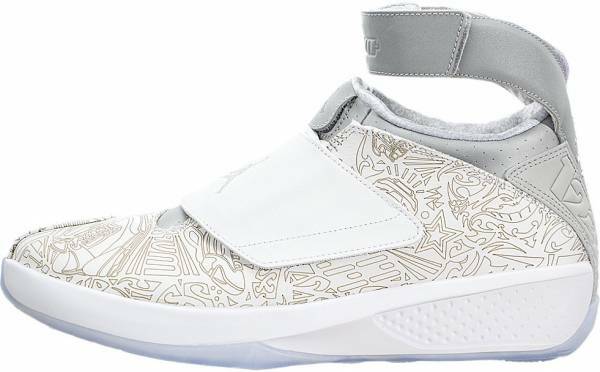 The midsole of the Air Jordan 20 features a new exclusive technology called I.P.S. or Independent Podular Suspension. These are ten foam pods strategically placed in key areas. With a Phylon carrier, this setup absorbs impact and delivers responsiveness. The heel-to-toe transition is also smooth and comfortable because of the arch support that the midfoot shank provides. The inside of the shoe is lined with memory foam pads for comfort. Traction. Depending on the colorway, the Air Jordan 20 has either a solid or translucent rubber outsole. The outsole features herringbone in strategically placed circles. Areas not covered by the herringbone are covered with deep and widely spaced diagonal grooves. The said traction pattern works well on clean and indoor courts. Length and Width. The Air Jordan 20 is said to come in the average width and length, but most wearers still advise new buyers with normal-sized feet to go down half a size to achieve a snug fit. Those with wider feet can go true to size. Lockdown. The Air Jordan 20 is actually a two-layered shoe. It has an inner sleeve that anchors the shoelaces and an outer synthetic layer that gives the shoe its form. The shoe also has a uniquely designed ankle leash that allows at least two support variations. To use it as a free-floating strap, the leash can be left anchored only on the heel. For a true mid-top feel, the leash can also be anchored using the flip-up tab on the tongue-top. This setup provides flexibility and mobility. The upper of the Air Jordan 20 has two layers. The inner sleeve is where the shoelaces with stylish chrome aglets are anchored. The out layer is made of synthetic leather, and it has a midfoot strap. The asymmetrical toe cap helps protect the shoe from occasional toe drags. 123456. The “123456” represent the six championship rings that Michael Jordan had won while playing for the Chicago Bulls. 85. The number “85” stands for 1985, the year the Jordan brand is born. 2005. The number “2005” represent the 20th year of the Air Jordan line. 20. The number “20” of course stands for the shoe’s model number. 23. The number “23” stands for Michael Jordan’s jersey number. The twenty herringbone pods on the outsole celebrate the 20th anniversary of the shoe. It is reported that the design of the Air Jordan 20 is inspired by 6 different Jordan shoe models. The Jumpman logo is found on the heel counter and the tongue.